Miles Pattenden Miles Pattenden is a research fellow at Wolfson College, Oxford and a lecturer in the Faculty of History, where he teaches British, European, and World History. Miles’ research concerns the catholic church and the growth of its global networks in the early Modern Era. He has published two monographs, «Pius IV and the fall of the Carafa» (Oxford University Press, 2013) and «Electing the Pope in early Modern Italy, 1450-1700» (Oxford University Press, 2017), and is currently writing a history of the Universal Church from 1400 to 1870 for Princeton University Press. A former Marie Curie fellow and Commonwealth scholar, he holds MAs from Cambridge and Toronto and a DPhil from Oxford. He has held teaching posts at Oxford University, Oxford Brookes University and University College Cork, and has been a visiting researcher at the Università Ca’ Foscari in Venice, the Università di Bologna, the British School at Rome and the Madrid Institute for Advanced Study. «Woolf: building the first blockchain university» This presentation describes our efforts to build Woolf: the first blockchain-powered university with its own native token. Woolf will be a borderless, digital educational society which reimagines how teachers and students connect and which will rely on blockchains and smart contracts to guarantee relationships between students and educators. For students, Woolf will be the Airbnb of degree courses; for teachers, it will be a decentralised, non-profit, democratic community; but for both parties the use of blockchain technology will provide the contractual stability needed to complete a full course of study. It is our ambition for Woolf to revolutionize the university. However, at its core, it makes possible the oldest and most venerable form of human education: direct personal, individual apprenticeships in thinking. Woolf has been developed by an independent group of academics (mostly from the University of Oxford), and experienced academics will form the first college in the collegiate university. We believe such a personal education will be increasingly valuable as artificial intelligence and robotics gain an ever-greater share of the current jobs. The Woolf platform is designed to reduce bureaucracy, lower tuition costs, secure teaching salaries, and increase the time that students interact with their professors. The result will be simple and powerful: students and teachers are brought together, no matter where they are in the world. Óscar Jerez Óscar Jerez Yañez holds a PhD in Psychology and Education, a master's degree in Education, a mention in Educational Informatics, a bachelor's degree in Philosophy and a bachelor's degree in Education and Psychology. Advisor and consultant in several universities and higher education institutions in Chile, Latin America, Europe and Africa. Author of books, articles and research articulated around higher education, especially in: innovation, curriculum development and teaching; teaching and learning centers and in quality management and assurance. He is currently a consultant of LASPAU affiliated with Harvard University, for the support programs for universities in Latin America; associate researcher of the Center for Advanced Research in Education (CIAE) of the University of Chile; member of the advisory committee of institutional accreditation and accrediting peer of the National Accreditation Commission (CNA); director/founder of the Teaching and Learning Center of the Faculty of Economics and Business of the University of Chile. «The challenge of innovating in massive university classrooms» In recent decades, talking about innovation in university teaching has become a recurring theme within the institutions themselves. However, what is innovation?, why should we innovate?, how can we innovate in the larger classes?, which are the effects and impacts of authentic educational innovation?, can we innovate from the routine or just disruptively? or how can be evaluated the effects and impacts of an innovation? During his presentation, the researcher will carry out an analysis based on the available evidence and the experiences of teachers and students, proposing models and actions that are feasible to tackle in the daily life of university training contexts. Ainara Zubillaga Ainara Zubillaga del Río is director of Education and Training at Cotec Foundation for Innovation. She has developed her professional career in different university institutions as a teacher, researcher and manager. At Camilo José Cela University she directed the Educational Innovation Unit and the vice-rectorate of Innovation. Doctor in Education Sciences from the Complutense, her research focuses on educational innovation, teacher training and the didactic use of technology in inclusive learning environments. Currently, her research work is focused on Universal Design for Learning. Member of the national network REDUNI+D (University Network for Educational Research and Innovation), and incluD-ED (European Network for Inclusive Education and Disability), she is part of the research team INDUCT (Inclusion, Universal Design, Cooperation and Technology) of the Universidad Complutense de Madrid, where she works as associate professor. Translated with www.DeepL.com/Translator Ainara Zubillaga del Río is director of Education and Training at Cotec Foundation for Innovation. She has developed her professional career in different university institutions as a teacher, researcher and head of management positions, such as at the Camilo José Cela University, where she directed the Educational Innovation Unit or the Vice-rectorate for Innovation. Doctor in Education Sciences from the Complutense University of Madrid, her research focuses on educational innovation, teacher training and the didactic use of technology in inclusive learning environments. Currently, his research work is focused on Universal Design for Learning. Member of the national network REDUNI+D (University Network for Educational Research and Innovation), and includingD-ED (European Network for Inclusive Education and Disability), she is part of the research team INDUCT (Inclusion, Universal Design, Cooperation and Technology) of the Complutense University of Madrid, an institution in which she is currently also an associate professor. «Innovate for a more human future: impacts on higher education» The digitalization and development of the 4.0 environment involves a series of transformations in different fields -social, labour, human, etc.- with important effects on the educational context and on higher education institutions. What's the new role of universities in a digital environment? How should the education system respond? New skills, new capabilities, new content, new professional profiles..... This talk proposes an open and shared reflection on the impact that the future 4.0 will have on the role of the university, the training of students and the creation of knowledge. The Ministry of Education, Culture and Sport (MECD), through the National Institute of Educational Technologies and Teacher Training (INTEF), develops strategic actions to promote the learning of coding, robotics and computational thinking in all school stages. During this talk we will learn about the most important initiatives, such as the development of a regulatory proposal, in collaboration with companies, universities and teachers, or the School of Computer Thinking, which will start operating next school year, 2018/19, in Spain. Fabián García Pastor Fabián García Pastor is an industrial engineer (Universidad de Valladolid) and MBA (Instituto de Empresa in Madrid) with a long experience in Information and Communication Technologies (ICT) in R&D and Corporate Development areas. Before joining the European Institute of Innovation and Technology (EIT), where he currently develops his activity as head of the Professional School, he worked for the telecommunications industry in several areas of Telefónica. Previously, he joined several small and big ICT companies in the private (Ibermática, Meta4, Yell) and public sector (Red.es, ONERA, NASA Ames). He has also been associate professor iat Universidad Carlos III de Madrid. Ángel Hernández Bravo Ángel Hernandez Bravo is a computer engineer, joined IBM in 1989 where most of his career has been dedicated to IT infrastructure for Defense and Security. He is a member of the CTO team of IBM in Europe for Defense, Security and BlockChain, and is the chairman of IBM's Technical Advisory Council in Southern Europe and Israel. «The value of Blockchain in the record of academic activity: technology and case studies» The application of blockchain and «smart-contract» technology in different areas of society is having a rapid growth, both as a support for classic business models and as a generator of new and unsuspected models. Blockchain can provide reliable data recording models in the field of training, but also makes it possible to provide career development advice in an environment where training offerings are increasingly complex. Enrique Alfonseca Enrique Alfonseca is a research manager at Google and leads a team working on «conversational search» for the Google search and wizard. He has held other positions in the same company since 2007, in the areas of Advertising Quality, Web Search Ranking and Natural Language Processing. He is the author of more than 75 publications in international conferences and magazines (see Google Scholar profile). He holds a PhD from the Universidad Autónoma de Madrid (2003) in Natural Language Processing and a post-doc from the Tokyo Institute of Technology (2006). «Dialogue modeling in the Google wizard and possible applications in teaching» In this conference, the researcher will describe how Google conversational search works, including the main challenges in transferring technologies originally developed for search on a screen with typed queries to the voice search paradigm, with or without visual support. It will pay special attention to the educational uses of the assistant, present a possible long-term vision of a teaching «assistant» and talk about the research challenges in making them a reality. Paulo Blikstein Paulo Blikstein is an assistant professor at the Stanford University Graduate School of Education where he directs the Transformative Learning Technologies Lab and the global FabLearn Program. Blikstein's research focuses on how new technologies can deeply transform the learning of science, technology, engineering, and mathematics. Paulo is also the Founder and Principal Investigator of the Lemann Center for Brazilian Education at Stanford, a 10-year initiative to transform public education in Brazil. Blikstein's research focuses on how new technologies can deeply transform the learning of science, technology, engineering, and mathematics. Best final Master work: Cristina Alonso Fernández (UCM), «Applying data mining techniques to Game Learning Analytics». Best final Degree project: Tania Castellano Brasero (URJC), «Creación de una aplicación educativa de realidad aumentada para el primer ciclo de Educación Primaria usando el SDK de Vuforia: EnseñAPP». Marcelo Milrad Marcelo Milrad is a full professor of Media Technology at the Faculty of Technology at Linnaeus University (LNU) in Sweden. He is also the director of the Center for Learning and Knowledge Technologies (CeLeKT). His current research interests include the design of learning environments to support learning about complex domains, collaborative discovery learning and the development of mobile and wireless applications to support collaborative learning. Professor Milrad teaches undergraduate courses in media technology and computer science with a special focus on XML, web 2.0 and mobile technologies. He teaches also at the international master program on Social Media and Web technologies at LNU. In addition, he is actively involved in doctoral courses in the field of Technology Enhanced Learning. «Pedagogical approaches and digital technologies to promote creativity, collaboration and critical thinking among students and teachers: challenges and perspectives» Our society is developing and evolving at a faster pace than ever before, challenging the public sector, corporations and individuals to deal with changes and uncertainties. Educational institutions must then be ready to prepare learners for this future. In this context, educational researchers and practitioners have demonstrated a growing interest in developing pedagogical practices towards fostering a participatory culture in all levels of education. These actions respond to current trends regarding participatory literacies as a key social value of the 21st century workforce. In recent years, different technologies and teaching practices have been proposed with the purpose of encouraging community participation and active involvement of students in their learning. Particularly, collaborative learning theories have exerted a prominent influence in these efforts. While it is argued that technology by itself has not an intrinsic value and effect in supporting teaching and learning, numerous recent investigations support that technology usage guided by an effective pedagogical rationale can be beneficial for learning in and outside the classroom. Creativity, collaboration and innovation as facilitators for learning and knowledge acquisition are fundamental skills that should be developed in school and beyond. However, creativity, collaboration and innovation are not spontaneous processes and therefore need to be systematically promoted and supported by novel technological solutions. Consequently, new and different strategies are needed to explore and promote innovative, sustainable and successful designs for Technology-Enhanced Learning (TEL). In this talk I will address and discuss those aspects related to how to promote creativity, collaboration and critical thinking among students and teachers supported by different kinds of digital technologies. I will first introduce some theoretical aspects in terms of perspectives and challenges in order to understand why it matters to study and implement them in the context of schools. Thereafter, I will turn the focus to a couple of our on-going projects in order to illustrate alternative perspectives on how to bring together different actors (public organization, schools, companies and universities) while addressing the issues above supported by novel forms of TEL. Towards the end, I will discuss factors, stakeholders and lines of action identified when attempting to introduce these ideas in many swedish schools. Roberto Martínez- Maldonado Roberto Martinez-Maldonado is a full-time researcher at the Connected Intelligence Centre (CIC) and data visualisation lecturer at the University of Technology, Sydney (UTS). He has a background in Computing Engineering. His areas of research include Human-Computer Interaction (HCI, CSCW), Learning Analytics, Artificial Intelligence (AIED, EDM) and Collaborative Learning (CSCL). In the past years, his research has focused on applying data mining techniques to help understand how people learn and collaborate in co-present environments, empowering people with emerging technologies such as interactive surfaces, combining available technologies for capturing traces of collaboration and helping teachers to orchestrate their classroom through the use of interactive devices and learning analytics innovations. «Making the classroom translucent through IoT technology and data storytelling» The aim of this talk is to discuss the potential of a new metaphor for bringing Learning Analytics into physical learning spaces that we call «Classroom Translucence». A translucent classroom or learning space would be that where activity traces can enhance awareness of teaching and learning practices while ensuring privacy and restricting the use of data for a particular situation. This presentation will showcase a series of current studies aimed at making teamwork and classroom activity more visible based on this metaphor. We have been rolling out multimodal learning analytics solutions into physical learning spaces to capture traces of activity that can potentially serve as evidence for reflection or for learners and educators to take immediate actions. Jan Vahrenhold Jan Vahrenhold is a professor of Computer Science at the Westfälische Wilhelms-Universität Münster, Germany. He studied Computer Science, Mathematics, and Classical Philology and received his PhD (1999) and venia legendi (2004) in Computer Science, both from WWU Münster. He was associate professor of Computer Science at TU Dortmund, Germany, from 2006-2012 and held visiting faculty positions at UMIT Innsbruck, Austria, in 2001/2002 and the University of Siegen, Germany, in 2002/2003. Jan Vahrenhold's research interests include Efficient Algorithms, Algorithm Engineering and Computing Education Research. He has (co-)chaired several international conferences in these areas and acts as co-editor-in-chief of «Computer Science Education» and associate editor of «Journal of Computational Geometry». From 2014-2017, he chaired the joint ACM Europe/Informatics Europe Committee on European Computing Education. «Clickers, e-assessment, and others: blessing, curse, or both?» The accessibility of digital classroom technology has motivated discussions about their use in higher education for some time, but there is still no apparent consensus. This talk discusses some reasons for this, both with regard to the limits and possibilities of the underlying technologies and with regard to the research questions in computing education. Colonel José Luis Carballo Álvarez José Luis Carballo Álvarez is a Marine Corps Colonel, he is a diplomate of the General Staff of the Armed Forces and a diplomate of the NATO Defence College in Rome. He has been technical advisor in the cabinet of the secretary for Defence Policy, head of the multilateral relations section of the Joint Chiefs of Staff and Commander of the Third Corps of the East Coast of the Marine Corps. He has participated in various peace missions since 1995, commanding the European Union Multinational Battalion in Bosnia and Herzegovina in 2008. He is the current director of the Virtual Education Department of the Armed Forces Staff College. Lt. Col. José Carlos López Palomo José Carlos López Palomo is an Army Liutenant Colonel (Infantry), he has a diploma in Military Computing Science since 1994 and has taken several review courses as well as courses on Information Technology Security, teaching and online tutoring. He has held positions related to training and computer science as a teacher in different centres for six years; and as an analyst, programmer and database administrator of the Integrated Logistics Management System of the Army (SIGLE) for eight, actively participating in the creation, maintenance and updating of this system. Since 2007, he has been assigned to the General Department of Recruitment and Military Education as head of the Virtual Education Unit, being the functional director and responsible for the Corporate Virtual Defence Campus since the initial conception of the project, having also actively participated in the creation, development, maintenance and updating of this system. «The corporate virtual Defence Campus (CVCDEF)» Ten years ago, the Defence Department began a project to unify all the existing e-learning systems in the armies and the navy. 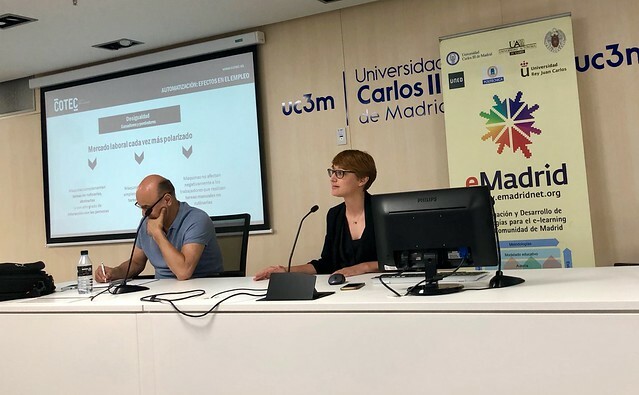 They are currently integrated in the Corporate Virtual Defence Campus (CVCDEF), which has used various e-learning platforms as a base and which since 2014 has been using by Moodle as the most widespread in the educational community and in Spanish universities. This talk will present the structure of the system to adapt to the organization, peculiarities and needs of the different Teaching Centers, Institutions and Units that need online training in the Armed Forces (FAS), as well as what is being done and how to work in the CVCDEF, ending with the presentation of the use of the Campus by the FAS Higher School, belonging to the Higher Center of National Defense Studies, as a reference center given its experience in e-learning.